Milan Design Week has become a must-see destination for Architects and Designers. Milan Design Week includes the internationally known Salone del Mobile taking place at FieraMilano and the Fuorisalone, a set of events distributed in different areas of Milan during the event, including must-see Brera Design District but also Tortona Design Week, 5 Vie, Porta Venezia and more. Milan Design Week is a reference point for architects and designers, and we are thrilled to be actively contributing to Fuorisalone this year with our Formations exhibition. During Milan Design Week 2019, Tarkett has chosen to join forces with Note Design Studio to explore the creative possibilities of its new collection iQ Surface. Designed by Note, and supported by Magis, Formations is an exhibition that questions notions of scale, by taking architectural archetypes and turning them on their head. Owning the space of the historic Circolo Filologico Milanese during Fuorisalone in the Brera Design District, the installation is a celebration and homage to how design language can be twisted into new creative phrases. The new collection iQ Surface is the result of a collaboration between Tarkett and Note Design Studio. A range with equal weighting to function, form and expression of colour, this new collection reveals the creative scope of Tarkett’s homogeneous vinyl flooring for a new generation of design applications on multiple surfaces including walls and furniture as well as floors. iQ Surface has colour curation as its driver. In a natural shift towards a more contemporary colour palette, five themes drawing on Note’s signature finesse tones and hues create distinctive colour families and surface techniques: Contrast, Rouge, Sober, Dimmed and Vivid. Beige hues tie the new collection together as a whole. Any two or more colourways can be connected and no design feels monotone, thus enabling the easy combination of different designs across the collection. 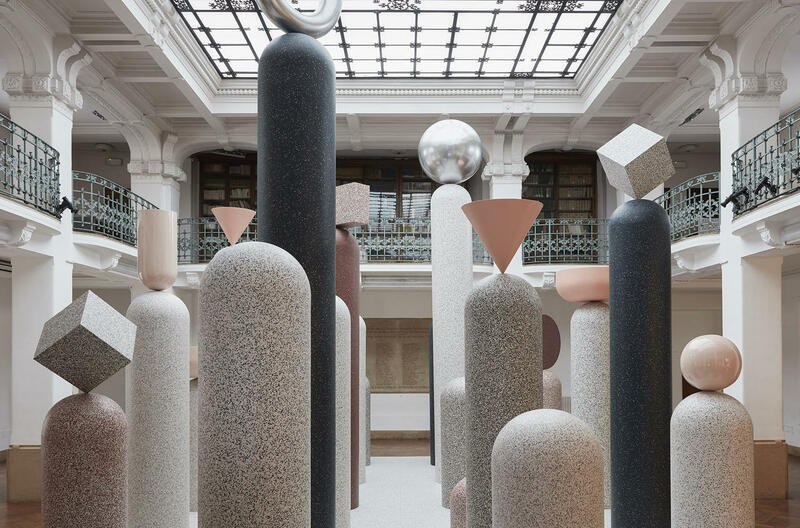 Formations can be visited at Circolo Filologico Milanese, Via Clerici 10 as part of Fuorisalone, 2019 Milan Design Week. Formations is two steps from Palazzo Clerici and the NLXL Wallpaper Design Winners Presentation. Metropolitan line 1 stop "Duomo e Cordusio"